A recent trend in sci-fi films today is expository dialogue. Sure, a lot of mainstream films do tend to verbalize the apparent in a condescending manner and have done so as long as there have been talkies, but it has increasingly alarming with Christopher Nolan’s prevalence. With his global success it seems as if writers of the genre have grown weary of their audiences’ intelligence. Either that or they’ve taken notes from Nolan’s films and decided that explicitness = success. And while this may be the case to some extent — I don’t imagine Source Code will lose box office because of its elementary writing technique — it certainly does weigh on the enjoyment and overall involvement of the more sagacious viewer. Going into Source Code, one problem you might anticipate it having is tedium as most films with an elliptical storyline do. 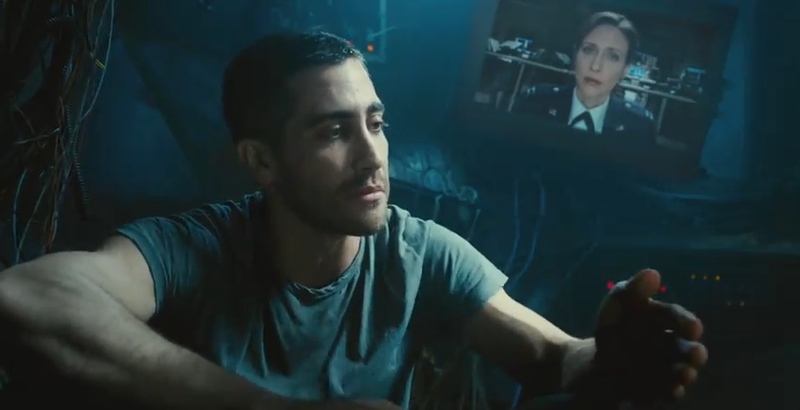 Given the peculiar setup – the main character, Colter (Jake Gyllenhaal) is only able to live and relive eight minutes of a dead person’s life in order to solve a mystery — the repetition of events actually makes the story more fascinating. After the explanation that he must find the person who planted the bomb on the train, we, like Colter, become very suspicious of each person that charts the train. Be it an old person who passes through the set inauspiciously or peculiar looking people focused on their digital devices, Duncan Jones involves us in the mystery by giving reason to question everyone’s intentions – even if there’s no reason to do so. From his spacious framework capturing the movements and interactions of twenty people at a time or investigatory close-ups of even the most seemingly irrelevant characters, it’s a thorough and successful mystery. The narrative is made stronger by relentlessly cluing us into the suspicious that Colter has and never being so vague as to dismiss anyone or too adamant to accuse everyone. We play on our own prejudices and work with our own perceptions as Colter does and reach a conclusion as to who committed the crime at the same time Colter does. Although a bit too explicitly solved to work as effectively as the mystery that preceded did even the realization of the would-be terrorist is commendable in that it isn’t such a vague assailant and one any person in the audience could have picked out in the early stages of the film as their shot in the dark. So on a whole this film is perhaps the most entertaining you’ll see all year. As an experience it’s the perfect popcorn flick, but at the same time, as aforementioned, the writing is what the norm is for popcorn flicks – preventing the feature from reaching any kind of intellectual or emotional greatness. We are given plenty of explanations into what the hell Source Code is – most of them by a hammy Jeffrey Wright in the role of the mad doctor – and the simplicity of what makes the story work (the unknown) is compromised by lots of scientific pontification in an attempt to convey the inner workings of the project to the incredulous viewer. The problem with this is that the explanations only further our inquisition because it all sounds too unbelievable. This prompts me to address all aspiring writers – if you have a cool idea for a story and it works in your mind but you find it hard to express the soundness of the science, don’t and hope your audiences gets it; if you have a cool idea for a story and it doesn’t work in your mind (like this) or it does but sounds too ridiculous to explain, don’t even try because you will hurt your script by bogging it down with uninformative and further confusing tripe. But if you do, please don’t communicate it through the form of a mad scientist, and if you do that, certainly don’t cast Jeffrey Wright in that role because it’ll convey a false ineptness on his part to viewers unacquainted with this great, under-appreciated actor. In addition to the scrutiny you’re prone to feel, you’ll also feel a lack of emotional attachment to the proceedings. This is another problem the script has in concept – it’s all plot driven and we’re given little reason to care for anyone, even the lead character. Writer Ben Ripley seemed to acknowledge this midway through his script and decided to toss in another mystery for Colter to solve – what happened to he and his platoon after his helicopter explosion in Afghanistan? Neither the mad doctor or his technician Goodwin (Vera Farmiga) want to give him any information about where he is or his past or even help him when things go array, so he does this himself by using minutes while in the Source Code to try and extract as much about him as possible from web-connected phones and even trying to contact his father because he misses him so gravely. It feels a bit contrived to give him these maudlin mysteries to solve – he couldn’t just be a man who signed up for the project and regretted it? – and though they don’t bring the film’s enjoyment down, they don’t give it the emotional resonance it sought. However these subplots do give Jake Gyllenhaal to channel rage more frequently; an emotion that the actor has proven time and time again to be the one he can most authentically convey and earn our sympathies with. Although Gyllenhaal is generally an ordinary performer he can do anger and confusion very well. Combine that with an arc that largely based on those two emotions and you’ve got the thirty year-old’s finest performance since Brokeback Mountain. Even if protagonist’s journey is without our emotional attachment, the film is not. In casting the role of Colleen Goodwin, the Source Code technician and Colter’s only human connection “that matters” in the film, Duncan Jones found great luck in landing Vera Farmiga. Goodwin is one of those characters who is set up with a simple arc – a regret for being in her position and exploiting a man against his will for the good of the country. It isn’t a ponderous part, but Farmiga makes it so. Her face and wild steel blue eyes often take up the entire frame when she’s present and with her trademark vulnerability being put on display, she becomes the film’s source of sympathy. She imbues the role with as much nuance as possible – a hesitation mid-sentence here, a very sorry look there – and though she doesn’t give her character a third dimension, she does as much with her character’s inner-conflict as possible. The finest actress working continues to prove her worth in even the most thankless of roles.